Frascati is located 20 km south-east of Rome and about 40 km west of "Fiumicino" Airport. The Frascati National Laboratories are about 2 km from the center of Frascati (Frascati map). From Fiumicino Airport "Leonardo da Vinci" to "Roma Termini" central railway station: take the "Leonardo Express" train; the journey takes about 35 minutes; tickets are available at the Airport station and cost 14,00 Euro. From Fiumicino Airport "Leonardo da Vinci" to the other railway Stations see Trenitalia site. 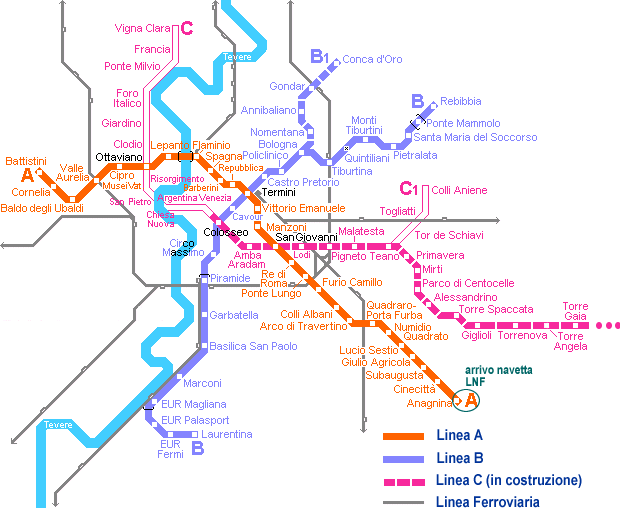 From Termini and Ciampino Railway Stations take a train to Frascati or to Tor Vergata Stations (see below). Alternatively, you can take a taxi from the Airport to Frascati (licensed white or yellow cabs are strongly advised). From Fiumicino the distance is about 30 km and the taxi fare amounts to approximately 70,00 Euro. From Ciampino the taxi fare is approximately 40,00 Euro. From "Roma Termini" to Frascati-LNF: take the train Roma-Cassino (FM6) and get off at "Tor Vergata" (second stop, close to LNF) . The journey takes about 20 minutes. The LNF are at 150 mt up hill on E. Fermi Street. Tickets are available at tobacconist's shops and newspapers kiosk and cost 1,50 Euro. From "Roma Termini" to Frascati downtown: take the train Roma-Frascati (FM4). Tickets are available at tobacconist's shops and newspapers kiosk and cost 2,10 Euro. It stops about 2 km far from LNF and it is possible to take a taxi to LNF. 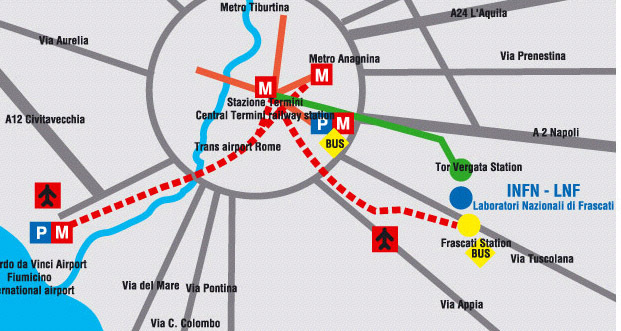 Otherwise from "Roma Termini" take the Underground - "linea A" (tickets cost 1,50 Euro) to the "Anagnina Station", then a bus (COTRAL) to Frascati (nearly every 30 minutes). Tickets are available at tobacconist's shops and newspapers kiosks. From Ciampino Railway Station to Frascati: you can take a train on both lines, to Tor Vergata(FM6)(1,50 Euro) or to Frascati downtown (FM4) (2,10 Euro). Note: remember to validate your ticket before you get on the train. Alternatively you can take a taxi from Termini Station. Fare amounts to approximately 52,00 Euro. Take the ring highway "Grande Raccordo Anulare", Exit 21-22, then the state highway "Tuscolana" to Frascati. Turn left (via E. Fermi) at the traffic-lights after Villa Mercede Hotel. The LNF are at about 1 km.